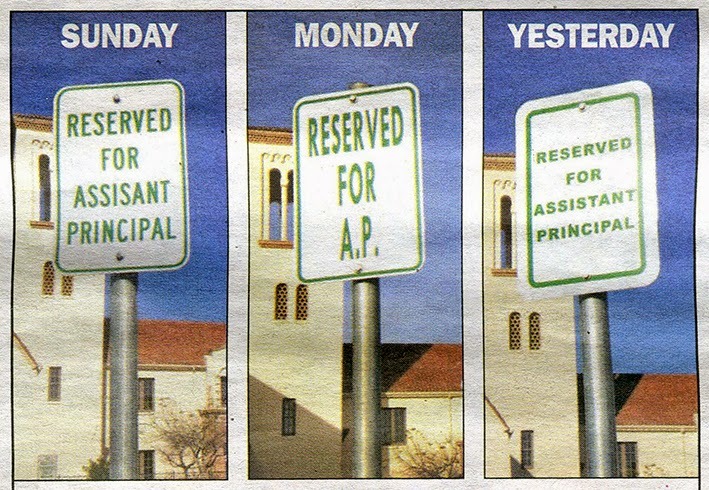 Palo Alto High School (Paly to its friends, apparently) was clearly not happy with the replacement parking sign which we talked about last week. I said at the time that I thought it represented a bit of a cop-out showing, as it did, the letters A.P. instead of Assistant Principal or, in reality, Assisant Principal. So, they've replaced the replacement with yet another sign with the full, corrected, title. Or should I say signs? Because there were, apparently, no less than three incorrect signs originally, followed by another three signs to replace the first three. And now a further three to replace those. What? Does it really take three signs to show one parking space? Just how big is the Assistant Principal's car? Clearly not as big as the AP's ego.